LOUDON, N.H. – NASCAR Monster Energy Cup Series star Ryan Newman was moonlighting ahead of the pack Friday morning at New Hampshire Motor Speedway. Newman led the way during NASCAR Whelen Modified Tour practice in preparation for Saturday’s F.W. Webb 100. Newman toured the 1.058-mile oval with a fast lap at 132.190 mph. Rowan Pennink of Huntingdon Valley, Pa. was second fastest during the one hour and 20 minute practice session. Pennink had a fast lap of 132.186 mph. Bobby Santos III of Franklin, Mass., the winner of the most recent Whelen Modified tour event at NHMS in July, was third fastest at 132.016 mph. Donny Lia (131.934) of Jericho, N.Y. and Timmy Solomito (131.897) of Islip, N.Y., rounded out the top-five in practice respectively. Woody Pitkat, who is replacing legendary short track racer Ted Christopher in the Danny Watts Racing owned No. 82, was 18th of the 28 cars on track during practice. Qualifying for the F.W. 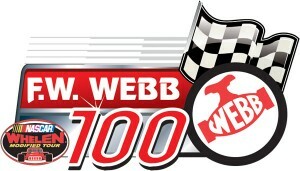 Webb 100 is scheduled for Friday afternoon.